Hmmm…so Neo-Calvinists, what have you been doing all this time if this doctrine is central to all things as your promo says? Suddenly you now offer the most important doctrine. I suggest theological and ecclesiastical malfeasance with such an admission. If it was and is so important, and it is, why haven’t you made it the centrality of your teaching and articulations all this time or…is this just another gimmick to incite spiritual anxiety in people who now believe they have been missing something and cannot miss this? The Calvin Institutes of the Christian religion is their playbook, and it is a very thick linguistic droning. This is their bible, and they are continually mining it for new ideas. Sometimes these ideas take a while to find in the book of Calvin. However, I believe it is the same document that will hang them because people are starting to read the document for themselves. Piper begins the promotion for the conference with a statement by Calvin, so let’s start with Calvin. 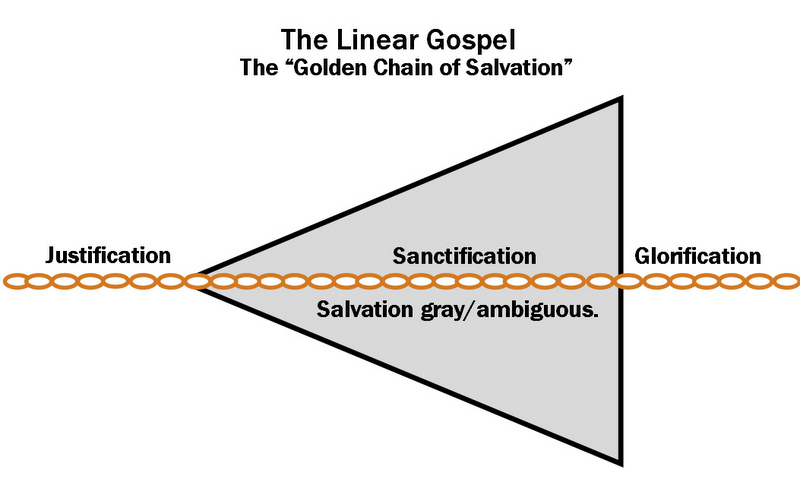 The crux of the Reformation false gospel is the idea that justification is not a finished work. 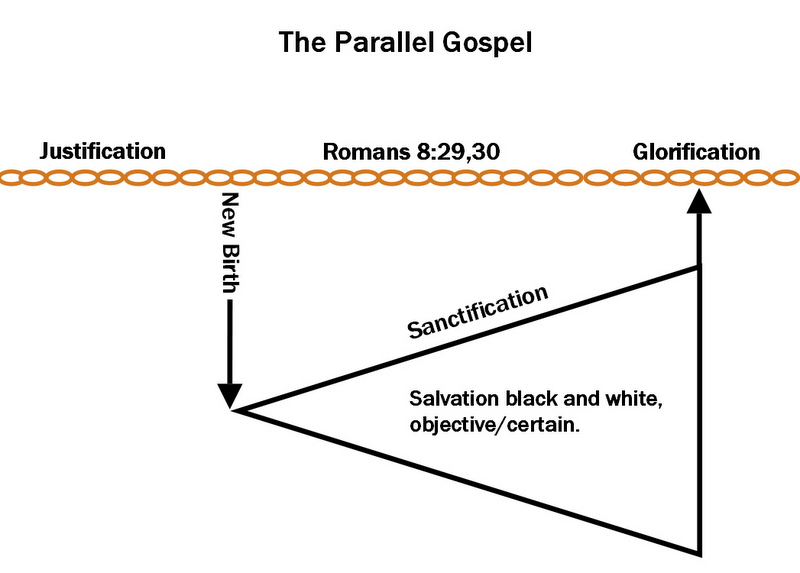 Therefore, they make the separate work of sanctification the growing, or progression of justification. The saint becomes a colaborer in the finishing of justification rather than a colaborer for the kingdom as an ambassador. The saint is not working towards a reward from his Master, he is working towards the final prize of salvation. Our “union with Christ” sanctifies our participation in justification. It makes running the race by faith alone possible. It enables us to gobble up more and more grace in order to keep ourselves saved—by faith alone of course. James addressed the problem of this very notion in James 2:14-26. It hearkens back to the problem of justification and sanctification not being completely separate; one being a finished work and the other being a progressive work. This is the Achilles’ heel of every false gospel that has ever come down the pike. We repeat, Justification is not a thing that we pass and get behind us. As Barth rightly said, it is not like a filling station that we pass but once. As we hold to its eschatological implications, justification by faith can never become static but must remain the dynamic center of Christian existence, the continuous present. We are always sinners in our eyes, but we are always standing on God’s justification and, perhaps more importantly, moving toward it. To be justified is a present-continuous miracle to the man who present-continuously believes, knowing that he who believes possesses all things, and he who does not believe possesses nothing. Such a life is only possible where the gospel of justification is continually heard and where God’s verdict of acquittal is like those mercies which Jeremiah declared were new every morning—”great is Thy faithfulness” (Lam. 3:22-23). But there is no “performance” for us by Jesus in the Christian life that maintains justification. That work is done. In regard to justification, “It is finished” and Christ has sat down at the right hand of the Father. We work together with Christ in our sanctification. Again, at issue is the fusion of a finished work with a progressive work. But since the Reformation sees justification/salvation as progressive, we must continually fill our gas tanks with the same grace that saved us. That is the essence of union with Christ; it enables us to receive perpetual fillings of salvation. There are two primary ways that we “keep ourselves in the love of God” or in union with Christ. 1. Mortification and vivification. According to Calvin, mortification and vivification is obtained through the union with Christ. It is a lifestyle of “constant confession and repentance” that avoids the pursuit of a godly life and embraces a life that is “literally Christ himself.” Simply stated, it is perpetual resalvation through the same repentance and sorrow for sin, and belief in the works of Christ only that saved us. By focusing on our depravity (“deep repentance”), a new need for grace is realized and when embraced results in a refreshing of the soul (vivification); viz, a joy experience. It is irrational to contend that sacraments are not manifestations of divine grace toward us… We conclude, therefore, that the sacraments are truly termed evidences of divine grace, and, as it were, seals of the good-will which he entertains toward us. They, by sealing it to us, sustain, nourish, confirm, and increase our faith. God gathers his people together in a covenantal event to judge and to justify, to kill and to make alive. The emphasis is on God’s work for us – the Father’s gracious plan, the Son’s saving life, death, and resurrection, and the Spirit’s work of bringing life to the valley of dry bones through the proclamation of Christ. The preaching focuses on God’s work in the history of redemption from Genesis through Revelation, and sinners are swept into this unfolding drama. Trained and ordained to mine the riches of Scripture for the benefit of God’s people, ministers try to push their own agendas, opinions, and personalities to the background so that God’s Word will be clearly proclaimed. In this preaching the people once again are simply receivers – recipients of grace. Similarly, in baptism, they do not baptize themselves; they are baptized. In the Lord’s Supper, they do not prepare and cook the meal; they do not contribute to the fare; but they are guests who simply enjoy the bread of heaven. 3. Absolution through church membership. Nor by remission of sins does the Lord only once for all elect and admit us into the Church, but by the same means he preserves and defends us in it. For what would it avail us to receive a pardon of which we were afterwards to have no use? That the mercy of the Lord would be vain and delusive if only granted once, all the godly can bear witness; for there is none who is not conscious, during his whole life, of many infirmities which stand in need of divine mercy. And truly it is not without cause that the Lord promises this gift specially to his own household, nor in vain that he orders the same message of reconciliation to be daily delivered to them. Wherefore, as during our whole lives we carry about with us the remains of sin, we could not continue in the Church one single moment were we not sustained by the uninterrupted grace of God in forgiving our sins. On the other hand, the Lord has called his people to eternal salvation, and therefore they ought to consider that pardon for their sins is always ready. Hence let us surely hold that if we are admitted and ingrafted into the body of the Church, the forgiveness of sins has been bestowed, and is daily bestowed on us, in divine liberality, through the intervention of Christ’s merits, and the sanctification of the Spirit. To impart this blessing to us, the keys have been given to the Church (Mt. 16:19; 18:18). For when Christ gave the command to the apostles, and conferred the power of forgiving sins, he not merely intended that they should loose the sins of those who should be converted from impiety to the faith of Christ;531 but, moreover, that they should perpetually perform this office among believers. This Paul teaches, when he says that the embassy of reconciliation has been committed to the ministers of the Church, that they may ever and anon in the name of Christ exhort the people to be reconciled to God (2 Cor. 5:20). Therefore, in the communion of saints our sins are constantly forgiven by the ministry of the Church, when presbyters or bishops, to whom the office has been committed, confirm pious consciences, in the hope of pardon and forgiveness by the promises of the gospel, and that as well in public as in private, as the case requires. For there are many who, from their infirmity, stand in need of special pacification, and Paul declares that he testified of the grace of Christ not only in the public assembly, but from house to house, reminding each individually of the doctrine of salvation (Acts 20:20, 21). Three things are here to be observed. First, whatever be the holiness which the children of God possess, it is always under the condition, that so long as they dwell in a mortal body, they cannot stand before God without forgiveness of sins. Secondly, This benefit is so peculiar to the Church, that we cannot enjoy it unless we continue in the communion of the Church. Thirdly, It is dispensed to us by the ministers and pastors of the Church, either in the preaching of the Gospel or the administration of the Sacraments, and herein is especially manifested the power of the keys, which the Lord has bestowed on the company of the faithful. Accordingly, let each of us consider it to be his duty to seek forgiveness of sins only where the Lord has placed it. Of the public reconciliation which relates to discipline, we shall speak at the proper place. Take note that Calvin is also confirming the Reformed belief that sins in the Christian life separate us from salvation. Therefore, the same repentance and faith that was needed originally continues to be needed as a way to keep ourselves saved. However, according to Calvin, the same gospel that originally saved us must be continually administered by Reformed pastors. “Unless a man be born again into a Christian Hedonist he cannot see the kingdom of God” (Desiring God page 55). “Could it be that today the most straightforward biblical command for conversion is not, ‘Believe in the Lord,’ but, ‘Delight yourself in the Lord’?” (Desiring God page 55). “The pursuit of joy in God is not optional. It is not an ‘extra’ that a person might grow into after he comes to faith. Until your heart has hit upon this pursuit, your ‘faith’ cannot please God. It is not saving faith” (Desiring God page 69). “Not everybody is saved from God’s wrath just because Christ died for sinners. There is a condition we must meet in order to be saved. I want to try to show that the condition…is nothing less than the creation of a Christian Hedonist” (Desiring God page 61). “We are converted when Christ becomes for us a Treasure Chest of holy joy” (Desiring God page 66). “Something has happened in our hearts before the act of faith. It implies that beneath and behind the act of faith which pleases God, a new taste has been created. A taste for the glory of God and the beauty of Christ. Behold, a joy has been born!” (Desiring God page 67). “Before the decision comes delight. Before trust comes the discovery of treasure” (Desiring God, page 68). Lastly, out of necessity, Calvin’s doctrine must depend on an allegorical interpretation of Scripture. As Rick Holland has stated, “bad grammar makes good theology.” That’s because this doctrine cannot survive a grammatical examination. Tripp, one of the more viral forms of Calvinism, concedes on page 27 of How People Change (2006) that a literal interpretation of Scripture does call us to “change the way we think” (one of the more passive forms of obedience), but that this approach “omits the person and work of Christ as Savior.” In other words, a literal interpretation that circumvents use of the Bible as a tool for returning to the same gospel that saved us cuts off the progressive justification process. 1. “We” are the authors of the theological journal published by the Australian Forum project that launched the present-day Calvinist resurgence: Graeme Goldsworthy, Robert Brinsmead, Geoffrey Paxton, and Jon Zens. Citation from Present Truth Magazine volume 35—article 3, Righteousness by Faith part 4, chapter 8. 2. The Blaze interview with Tullian Tchividjian: Oct. 15, 2013 9:01am | Billy Hallowell. 3. CJ Mahaney has used this theme many times and prescribes “preaching the gospel to ourselves” as the prescription. In reality, this is a means of keeping ourselves saved according to Reformed theology. 4. The Calvin Institutes 3.3.9, first sentence.